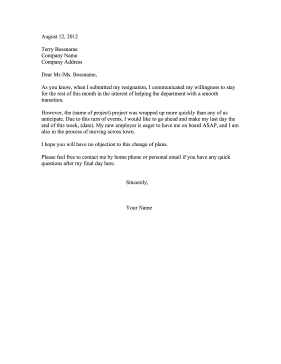 This printable resignation letter shortens an original notice period due to completion of projects. As you know, when I submitted my resignation, I communicated my willingness to stay for the rest of this month in the interest of helping the department with a smooth transition. However, the (name of project) project was wrapped up more quickly than any of us anticipate. Due to this turn of events, I would like to go ahead and make my last day the end of this week, (date). My new employer is eager to have me on board ASAP, and I am also in the process of moving across town. I hope you will have no objection to this change of plans. Please feel free to contact me by home phone or personal email if you have any quick questions after my final day here.